15Five Continuous Performance Management is a performance management solution that combines employee feedback, pulse surveys, peer recognition and OKR tracking in a lightweight weekly check-in. Work for 15Five Continuous Performance Management? "Love how 15Five can service me and my company!" I love getting feedback from my supervisors! I also like the chance to answer questions my supervisor poses, which are crafted just for me. She is intentional about what she wants to know about me, and I love that. I don't dislike anything specifically, but sometimes taking the time out of my day to review can be annoying, but in the end its great! I also wish I could start filling the platform out earlier. I know the point is to reflect on your week, but sometimes I like to "take notes" and start writing down my thoughts early! I'm solving communication barriers by being able to express how I feel on a weekly basis. I'm also finding ways to express my gratitude for coworkers through an online platform. Since our company is built around work from home, it's nice to communicate with each other about our wins each week! "15 Five Review - Highly Recommend! " 15 Five helps me look to the future, and plan my goals for the next week or month. It is easy to work day to day, but difficult to plan future goals - 15 Five helps me accomplish this! Creating small tangible goals that I can tackle over a week helps me move forward with my role and career while keeping what is important in mind. It is very easy to lose track of what is important in the workplace since there are so many distractions. 15 Five helps me stay focused and on top of the important things. I also really enjoy the peer feedback i am able to give to my teammates. It helps me appreciate the accomplishments over each week that my team does. It also feels good to have receive recognition as well as give recognition. I like the emojis, and smiley faces. Creating checklists of accomplishments is wonderful. Tracking your High fives feels like a huge accomplishment, and is a fun timeline of the history at my current job. The main point is tracking personal progression is very difficult, and 15 Five makes doing so simple, effective, and transparent. One of Cisco Meraki's values is to simplify everything - 15 Five does just this. I dislike the team wide engagement section when the 15 Five is submitted. Start using it sooner rather than later! Forgetting about the current problems that have crossed over from a previous week. "It is an awesome to track both employee and manager progress and goals. " I like that it is a good work planning and feedback tool. The fact that I can use it to track my previous and current goals and be able to review them at the same time is a good feature for me. I love how it brings up my goals and allows to check whether I have completed them or not is a good measure of my performance and enable to analyze what I have done and what needs to be done. The questions can be at times repetitive. I would recommend 15 Five since it is an awesome tool for tracking employee progress and performance. It helps keep track of your goals including what you have completed and what you have not and helps plan yourself better. "Incredible Tool For Team Performance"
15Five not only keeps a team productive by setting and tracking goals, it also makes a team more productive by insuring that all team members are heard. 15Five facilitates a culture of growth and encouragement. They're "High Five" feature allows for coworkers to give one another shout outs which boost morale! Looking back on the dozens of weeks of reviews I have I'm able to see what direction I'm going as an employee and talk to my manager about where I'd like to go. We can create a career vision inside 15Five and use that as fuel to make the best outcome possible. 15Five allows for touchy subjects to be brought up immediately, rather than waiting potentially weeks or months until a formal review. The const pulse that 15Five adds is the greatest feature in my opinion. I absolutely cannot state enough how amazing it is to be heard every week. 15Five is incredible, but it could grow by adding more data visualization and make correlations between various data points. 15Five immediately improved morale and production. When you start using the software be sure there is a lot of weekly back in forth between managers and employees. Encourage the high five feature and make sure leads respond to their team's feedback. I've personally noticed that certain events make me unhappy in the workplace. My manager has noticed these trends and changed things around to make me happier. Furthermore I've noticed that writing down goals makes it much more likely to accomplish those goals. "Consistent and reliable evaluation criteria"
"Brilliant for OKR's and engagement"
15five is simple to use and it's effective. We first procured the system as a tool to govern our OKR's, and it worked like a charm from day one. However we discovered much more than that. The one on one tool helps managers to have meaningful discussions with their team members. The self review tool is also great for reviews. Our team enjoys it. And off course the weekly 15Fives are also great for planning and feedback. Great tool and I will definitely recommend it. Not much to be honest, the tool works really well. 1. OKR's - it helps our whole company have smart, directed goals that keeps us moving forward. 2. Pulse - at a snapshot we can see how our teams are doing. 3. Recognition - the ability to give people high fives is awesome. 4. Reviews - quarterly reviews are great. I have realized the importance of constant communication and clear written intent and expectations. This makes it easy to achieve that. "15five automates management away from needless failure"
My experience with 15five has been nearly all upside. It takes all of my workaday tasks as a manager (goal setting; clearing process roadblocks; digging into performance challenges) and puts them under one roof, so to speak. I no longer need to use Evernote, Email, and a host of other communication and note-taking media to kludge together my own solution. 15five has a moderate learning curve, and some of its most powerful features (for example the ability to move employee or manager comments to 1-on-1 agendas or lists of wins and challenges) are not very well-publicized within the workflow. Once you get over the learning curve, though, it's a very powerful and useful tool. Work with customer success team to ensure all your trial users are using all of the most powerful features of the product! Many during our trial period questioned the value based on a surface-level engagement with the feature set. Thanks to using 15five, I spend less time on each report with no loss in the fidelity of information exchange, and given that my reports are proactively preparing for and setting the agenda for their own 1-on-1 meetings they are subsequently more likely to feel engaged in the process. We're using 15five for allowing employees to give recognition and feedback to one another as well as set long- and short-term career growth goals. As we implement the inbuilt OKR-tracking, I think we'll see improved alignment from top to bottom. This is a very easy way of communication, planning and feedback for any size of the company. It allows you to track the most important guidance and alignments and not loosing it in a bulk messaging process. If you're looking for an action plan keeper - this is not your product. If you want to unite the team around common goals, improve team strategic thinking skills, teach the team to plan, do, adjust and communicate their plans, successes and challenges - go for it! This is a great tool that keeps you focused on the most important things. At the same time it allows you to adjust you plans appropriately, keeping track of all the changes. Managing remote colleagues, making sure that all team is looking to the same direction. You can see who is really working towards the plan and who is putting the same task from week to week. Short and mid-term performance management became way more transparent. "Awesome tool for making Job Performance an ongoing conversation"
I love that 15Five makes it easy for employers and employees to have an ongoing conversation about Job Performance. It is also so much more than that! As an employee, I feel heard, and appreciate that my supervisor is taking the time to check in with me regularly. It helps me to stay on track, and be reminded of what my goals are, and gives my supervisor a chance to give regular feedback. I have worked other places where there was nothing like this in place, and people were frustrated with the lack of feedback. I think these conversations can be difficult for managers to handle, and I love how easy 15Five makes it. As an employee, my only complaint is that the questions sometimes take me a while to answer (some of them are very thought-provoking). When I have a lot on my list, this can seem like just another task that I need to get done. However, I know that it is to my benefit and to the benefit of the organization I work for. The benefits of 15Five are numerous. Employees are given the opportunity to regularly share their goals and let their manager in on what's going well, and what may not be going so well. More than that, it gives managers the opportunity to offer help or direction in areas needed. I believe this is a huge morale-booster and allows employees to feel heard and valued while making it easier for managers to stay engaged with their employees. I've been employed for more than a decade now. Worked with various company and it's my first time using 15five. It's an amazing tool that guides me with my career, reminds me of my goal and makes me oriented on the job that I need to accomplish on a weekly basis. I've been employed with Hearsay for three months and it really is handy for my JOB. The only challenge that I can site is that. Given that I am new to the company, it's my first time to use 15five. No one on board me on how to use it and I have no formal training to maximize its function. It's just lately that my supervisor updated the 1to1 field and I get to realize that she needs to acknowledge my points and provide coaching points for me. I'm not sure on how this works, but I think it would be best to have a trainer conduct the how-tos of the product especially for big clients. It's a powerful tool that helps your employees focus on their goals and identify their own areas for improvement! a wonderful coaching tool and a way to commend your fellow employee. In my case, I'm an entry-level employee for Hearsay and the business problems that we are focusing on is more on my personal goals and improving my own AFI's. The benefits that I realized is that, I can apply the S M A R T (short, measurable, attainable, realistic and timebound) approach in targeting my goals given that 15five would require me to update on a weekly basis. "Team Overview without the "Overview""
I truly enjoy the fact that I can set the pace for feedback for my team without constantly having to check-in. 15Five provides self-paced reflection for my team, giving them the opportunity to reflect on the successes and troubles they have had all week. While giving me, their manager, the chance to reflect on a course of action to best help them. I dislike that 15Five does not broadcast the "High-fives" members usually give to people outside of their organisation. One way I think 15Five can solve for this problem is by providing a social media / LinkedIn integrator where users can publicly opt to display their "High Fives" (received and given). This is a great tool to use if you are focusing on management from a perspective of empowering and ensuring that those who report to you feel as empowered as they are to solve the problems they face as well as giving them a natural 5 minutes a week to sit down and reflect on the workload from the past week. Not only can I do that with this product, but in many cases this product has given my team the ability to give me insights into situations I mat not be aware of. The business problem I am solving with 15Five is the need we have as upper management to monitor the progress and problems of our consultants while giving them the ability to remain completely autonomous in their work. "Best Performance Management Tool for Startups"
Best tool to understand the Goals, Objective of each department and their team members, So on a whole everyone works towards the growth of the company. It helps us to define our weekly Task which we did and also plan for the next week based on the result for last week goals. Nothing much. It helps us to do Self Review on each OKR, but I feel those questions should be more specifically related to the work what we do and not generalized. If you want to have a plan - task & objective towards a goal, then its the right tool to manage your performance at each level. As a Business everyone needs to work together irrespective of the different departments. So here we know what everyone person in our company and does and how well it is aligned towards the overall goal of the company. its helps us to stay informed on our performance and objectives which needs to be obtained. "15Five is great for collaboration"
15Five allows me and my supervisor to be on the same page. It's easy to use, provides me with thought-provoking questions, and helps my supervisor to understand me better. I can write things that I wouldn't have time to say otherwise, and feel safe to be honest. It also features 1-on-1s, where I can come prepared with talking points to keep our meetings efficient and well-spent. At times, some of the weekly questions can be difficult to try and answer. The High Five feature seems generic at times, too. Lastly, we haven't gotten into the Objectives piece yet, but some of our staff have had problems understanding the format and how they are supposed to be submitted. It'd be nice to have a handy example of such. Rather than being disconnected, 15Five has allowed my supervisor and I to be in touch with one another on a weekly basis - something that we don't always have time for in-person. It helps us to have mutual understanding, where I can ask questions, share challenges, and receive feedback anywhere at any time. One of the biggest benefits I've found is that since using it, I'm constantly thinking of the questions throughout the week. This, in turn, helps us to fill in gaps and solve problems that may have otherwise been forgotten about or overlooked. "15Five is a must for management when it comes to planning and tracking performance"
15Five has an intuitive interface making it easy to use. This amazing software promotes best practices in setting goals, measuring results, providing a positive environment to celebrate wins and allow dialog to begin on improvements. Keeps us on track with regular performance evaluations too! The only thing I dislike about 15Five is that it took so long to find it! It truly has helped our growing organization to get a handle on routinizing our meeting and evaluations. Through 15Five, performance evaluations became regular, consistent, and valuable. In addition, it provides a great mechanism to conduct One-on-One meetings that are structured and prepared. Plus, it adds a great way to celebrate "wins" within the organization and give a weekly snapshot of progress, successes, and challenges that can be quickly addressed. "Comprehensive Performance Management Program "
The ability to comment privately or publicly is something that I appreciate as there are some things that I only want to say to my manager and wouldn't want others to see. I also love checking goals off my list each week. I think it would be really nice if we could give high fives all throughout the week rather than just in our final reviews for the week. I think 15Five makes it really easy to keep up with the goals that you've set for yourself and completed throughout the year. Since all 1-on-1's and answers to questions are easily accessible, you can revisit to remind yourself of what you talked about when it comes to Performance Review time. It's a great program and seems very customizable on the admin end as well. It definitely helps me set measurable business goals and reminds me to work on them. "Effective and very user friendly"
It´s very easy to use, the objectives an reporting are very useful gives the whole management team visbility to what each employee is working on, The high fives are a great way to show your appreciation to your coworkers on an individual level, yet it is visible company wide, Overall i would recommend it as a performance management software. The custom reports are very useful if you need extra detailed information, but creating a custom report takes a little longer than expected if you want to retrieve data for longer periods of time. Creating objectives and having the visibility and transparency definitely allows the employees to know what the management team is working on, allowing the company wide to focus on working towards the same goal. "Great but could use some improvement. " I appreciate the culture 15Five fosters of constructive positivity and constantly collaborative back and forths. This may be customizable by enterprise, but I wish we could add more fields for what's going well, what could use improvement. I usually have more than 1 of these items, and would like to separate them more. Add more items like "things that are going well." Also, change the wording of "things I'm 'stuck' on" –– often I'm facing challenges but not stuck, that's too negative and not accurate. The fear and reticence to talk to your manager! It's incredible healthy and helpful to have a culture of constantly checking in. It focuses dialogue as a helpful thing instead of an intimidating review thing. "Unique way to interact with employees and the employer"
I like the High Fives. It gives a rewarding feeling like you've done something great for the company, very cool. I also like the 1 on 1s; very unique approach in updating or tackling one's task or priorities for the company. The ease of navigation to each of the sections in this program. I cannot see any part of this platform that made me dislike any features. The High Fives alone makes this platform very likable in all aspects. A very unique platform to bridge the gap between the employees and the employer. If you are looking for a cool way to address someone's achievement or just make someone happy because of their positive impact on your company. "Still the best tool I have used for coaching and development feedback"
I love that I can easily send over any feedback, questions or concerns to my manager. They have a chance to review and respond. Makes the talk track for our one on ones so much smoother and relevant to what is impacting me. The ability to recognize my peers is extremely helpful. Rotating questions is a good way to ensure the feedback and answers given are relevant. For the most part, the interface is easy to use and pleasant on the eyes. The performance of the site itself is on par with high-end sites. It has been easy to adopt the tool and using it creates a natural flow to coaching and feedback conversations. The ability to keep a record of completed tasks is helpful for performance reviews and for your own personal development. The manager notes are a good addition as well. Required questions are not easily identifiable. There is no customization for your page or personalization. The options for group feedback as a team would be good or even creating groups to be able to recognize entire teams easily. Communication and feedback. Stagnant career development paths. When getting a new supervisor this is a great way to break the ice in an efficient manner. I have been able to use 15Five to communicate with senior manager and establish new relationships that would have been otherwise difficult to realize. "This is an amazing tool to improve communication between your team members, peers, and organization." I like the goals checklist of things and how things move over from your Goals into your 1on1s. I like the percentage of goal completion tool. I like the 1on1 tool. I like the layout of 15Five. I like being able to see my team. I like the email it sends us after submission to help ensure that myself and my direct report is on the same page on a topic of discussion point. I wish Action Items in 1on1s would move directly into the next 15Five. I don't like that it does not do this. I also wish that we could get some sort of acknowledgement when we push something to the next week's 15Five. I'm not sure if it is possible, but if it had integration into a Google calendar to add reminders there rather than only the email notification reminders. This really is a game changer on improving communication within your business. We are able to capture tasks and goals and put timelines and progress around them. This is something that would get lost in the weeds with some of our individual contributors. "Positive Employee Career Path Builder & Goal Tracking "
Employee goal management, Manager Transparency, Peer Recognition, Clear Career Goals & Performance Analysis, Opportunity to share feedback with the CEO & Direct Manager. I can't think of anything I dislike other than the format of setting your goals for the week ahead. I feel like that should be a task to evaluate on Monday. This is an incredible tool for holding your employees accountable and keeping transparency between manager/employee relationships. It's a positive place where employees can analyze their own performance in addition to sharing issues, questions, and wins with their manager. Most of the time, managers don't get to see everything that their employees do on a day to day basis, so this makes it easy to share your wins & areas of opportunity! This is the easiest way for employees to stay accountable on their short and long term goals for both personal development and for PDM's overall business growth. It provides transparency for both manager and employees to track their progress and identify areas of improvement. It's been a positive way to show employee & colleague appreciation through weekly high fives that are shared with the person who received. "Fantastic tool for communicating your ideas with peers and management"
The fact that you can interact with your manager and able to appreciate those that have done something great. Setting goals with 15Five is fun because your manager can keep track to your goals at any given point without really having a meeting. The notifications feature is spot on. Sometimes, it's difficult to change the questions being asked and this can lead to boredom. It the company can come up with a list of customized questions for different industries, that would be great. This is an awesome product that I would recommend to any organization out there. It does not matter which industry because it can be customized to suit your need as an organization. I have seen great Ideas come from this platform and issues resolved before it goes too far and cause problems in the organization. Communication problems are solved 100 %. Clarity about goals is achieved and hence increased productivity. "15Five is a great tool if you and your team get behind it"
I think that 15Five does a great job at keeping you honest about what you're trying to accomplish on a weekly basis. If your whole team adopts it, it will serve you well at creating conversations for your 1 on 1's and gets you thinking about what is going well or not so well. Also, the streak tracking is a great way to make me want to keep up with my reviews. High Fives are amazing as well. There's not much to dislike with 15Five. If I had to be picky, I'd say that they could create more of a variety of questions to ask, weekly. There are a lot of repeat questions that I now choose to skip that I was answering at first. We're solving internal communication issues and measurable performance goals. 15Five is a great way to open up conversations and help individuals set specific goals on a weekly basis. "Great to keep your finger on pulse of your team and goals organized!" I love that I can see my whole team's answers in one place, that I can add items to 1:1s, and assess team morale quickly and easily. I love that team members can mention other team members and give them a "high five". Great for engagement! So far I have nothing I dislike. I'm adding more features to my use of the product each month it seems. We are now utilizing 15 Five for objectives and Key Results, as well as Best self Reviews and so far have no challenges or issues. It helps departments stay on top of employee engagement, recognition, and also goal management. In addition it provides an easy way to ensure employee reviews are worthwhile and well managed. 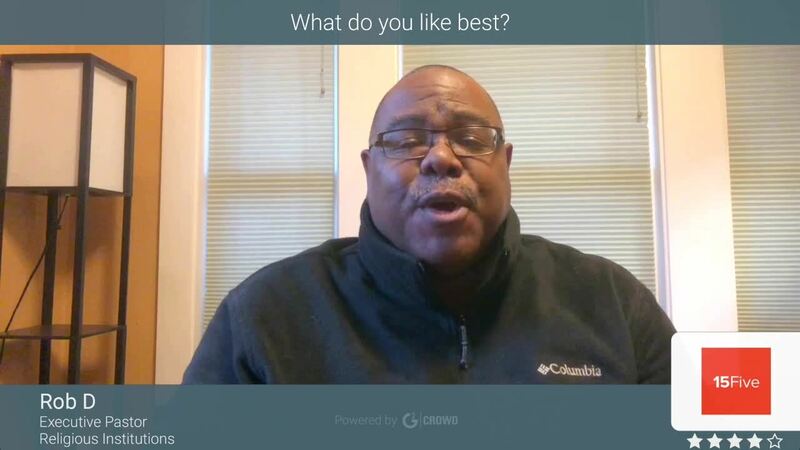 The Best Self Reviews are easy to fill out, have solid questions that push the employee and manager to think deeply about the employees contributions and challenges. They are also easy to track. "15/5 Makes My World Go Round"
I love the usability - it's easy to click on things and make the changes live, it's visually stimulating and pleasing, and the functionality helps to keep me and to keep my team on track. It's not always intuitive to figure out where to click and it's not always accessible for me to edit Objectives when there is a hierarchy and I'm trying to assign it correctly. I often do this wrong, and I think it's because the way the page is set up, I miss something along the way. It's great and I would definitely use this in future work spaces. It's easy to use, log in, add to your agenda, and helps to keep team members on track and supervisors filled in without having to use that time in meetings to discuss all of the things in 15/5. It also is fairly quick to fill out and to review and I like the auto-save feature. Only recommendation for enhancement would be to enable a link so that I could click on a report to view the number I'm looking up to add to the 15/5 progress. I have had to create a separate doc to track all of my progress and input it into 15/5 which creates an extra step. Establishing PD goals for our team and keeping them on-track; it shows that we are committed to their progress and can track their goals weekly and quarterly. We are able to stay on track and show how numbers matter to the work we do and how we work toward these numbers with the everyday work. It makes it more tangible for my team to track their own progress toward their job duties. We can focus on specific priorities - this helps me to review what I said I would do (and then do it) as well as plan for my week ahead to see what's "on deck" and how I can prep and setup my week. "15Five is great for improving employee wellness and it makes management easy"
15Five is great for managers who need to keep up to date on their remote employees and it's also great in the fact that its like a quick face to face meeting, I can keep my manager up to date on how my week is going in the matter of 5 minutes vs a 30-60min face to face meeting. Since our company started using 15Five I've never felt isolated the way I did before, every week I get to tell my manager how everything is going and I also get to answer some important questions which help my managers ensure that we are on the same page. Its another tool which can further isolate people in the fact that it eliminates what would've otherwise been personal contact. However that can be good for some remote people. It would be nice to have all aspects of performance monitoring in 15Five, rather than 15Five and Jira for example, a Jira plugin would be nice. I highly recommend it if you feel like you aren't getting important feedback from employees, you can ask them slightly sensitive questions and get valuable information you may not have gotten otherwise. This tool encourages and increases important conversations. It is great for remote employees, as someone who usually works remotely it has been a great way to keep my managers up to date and my progress and to facilitate important conversations that would've otherwise required a slack message. "Good tool for weekly updates"
15Five has provided an excellent resource for our team to communicate, and provide weekly status updates and plans for success. I enjoy the available access to gain insights throughout the organization, as well as the ability to recognize significant achievements by peers and colleagues. My biggest dislike in using 15Five is primarily internally-based, as we have not leveraged capabilities of leveraging a variety of questions to allow for new and fresh perspectives around a diversity of topics. Our experience has primarily focused around similar questions, week-in and week-out. I would recommend 15Five as a great tool for facilitating engagement across your team and/or organiziation. The tool continues to improve, and I expect will see additional improvements to make the tool even stronger. We are solving the business problem of how to effectively communicate, and provide status updates throughout a fast growing organization. It has been a positive within my team, with 15 different professionals. "One of the best status tools I've ever used"
15five makes it incredibly easy (and fast) for me to update my boss on my projects. I feel like I'm more productive and have more support on what I do as a result. The notifications are a bit annoying, but I think that that's true of any product you're supposed to get into the habit of using. There have been many weeks where I'm late to write a 15five, so the reminders are annoying–that said, I can turn them off (and I know that). They're good for me, to keep myself compliant. We are solving the problem of communicating our regular work to our boss, including "wins" with clients and "losses" or "shortcomings". We could, ostensibly have more meetings, emails or slack chats–all of which would be REALLY distracting and take us away from our work. Those all tend to take far longer than 15 minutes, and with 15five, I can update my boss on ALL of my outstanding client work in 15 minutes (instead of just one). Their product is easy to use and a really neat way to provide transparency throughout an organization. I love reading weekly reviews from my peers to get a look into how they may have experienced the week differently than myself. I honestly don't dislike anything; we're happy with 15five. I use it every week and I have no run into any problems or limitations for our current implementation. Do it! High fives are the best! Weekly check-ins with my manager who lives in a different country (and timezone) are easily completed through 15five. I also love the 1:1 notes section to easily track what my manager and I talked about in previous meetings, as well as track ongoing conversations. High fives are such a great way to call out the hard work of my coworkers and make sure they feel appreciated. And who doesn't love receiving high fives? "Utilize 15Five every week with my team"
I love the high fives, it gives a very encouraging mentality to our team! Especially since I'm mostly remote from my team, it makes me feel more included and makes it that much better when I get a high five! Because I know I'm doing something right. I also love being able to @ people on the team, this allows everyone to know who I need to work with in the coming week. Also, allowing outsiders on the team or managers to know that I'm getting work done, and allowing me to know what my colleagues are working on. Also, LOVE that I can copy tasks onto the next week! That is SUPER helpful. I dislike that I don't complete my 15Five on time every week. This is no fault of yours... I wish I had better reminders rather than via email. I want an automatic calendar invite to be sent so that I actually know when to fill it out. That's probably an unreasonable request, but I have so much going on during the day that I always forget. Go for it! This is one of the best products I've used for a team management system! With our UX Design and Research team, we are solving the problem of keeping everyone in the know. It's hard having a semi-large team and not knowing what everyone is working on or who to collaborate with on what projects. We solve the communication issue head on with 15five. "Great Set-up, Easy to Use, Clean Look!" The look-back ability for Annual Reviews is such a great feature that 15Five recently added to their Plus plan. It increases the ability to accurately reflect on wins and areas of opportunity over the last year. We most often use it for 1:1's so having the ability to see progress and comment on things is great for our supervisors. I wish there were more features available in the basic plan. The new features that were added fit so well with the intentions of the product so it stinks if you are unable to move up a tier. I do wish you could mass change supervisors as well. Ensure that all of your supervisors are onboard and understand the amazing opportunities this product has to offer. It is beneficial for both the supervisor and the employee to really engage in the product. We utilize 15Five for 1:1's and check-ins for our employees. With over 500 employees it helps to be able to at least see how they are doing on a scale of 1-5. "15five keeps everyone on the same page"
I love how 15five is able to connect everyone and make sure employees know what other people are doing. It is ncie to have my boss know what I am working on without scheduling a whole meeting for it. I also love giving high 5s, its a nice way to thank others for their help! Make sure you have your employees set up your campaigns so they are easier to track, we did not have that for awhile and we were just answering the questions our boss needed us to but once we set up our OKR's, things were a lot easier to track. Also encourage people to give high 5s! its boosts your team morale. We are solving communication problems and we are able to keep everyone on track. It has helped me keep my priorities straight so I can work on what is most important. "Love being able to review past goals and look forward!" I love the consistent check-ins, being able to track where I've been and where I'm going. It's easy to lose sight of how goals move week after week, so being able to see it all come together after time is great. I love being able to get a regular pulse check, and look internally to organize my goals and share them with my supervisor. It's a great way to give and get feedback within a team on a regular basis. Everything is really great! The only suggestion is to have an option to kick goals farther than the next report. Like if I didn't get to a goal in a week, instead of recycling it for the following week, having an option to schedule it to be a goal in a month or so. My manager and I have regular check ins to review the 15Five, and it's a great time to throw some transparency on the routine of work and air any thoughts either of us have. Nothing builds up, and I know that I can always communicate with her. "Key part of our culture shift"
The best thing about using 15five is that the team has visibility to each others thoughts and ideas. I use it as a manager, and I really appreciate the open communication that it facilitates. We can all ask follow up questions or add to what has been said, without all needing to be in the same room (meetings: ick). It promotes feedback, openness and idea sharing. Not so much a dislike, but it is difficult to implement. There are some growing pains in getting the team to understand that it isn't busy work or another way to monitor their work. Attend webinars! Use the chat! Your team needs you to be fluent in this software for them to have faith in it. Openness!! Hands down, we had a cultural problem with people feeling like they can say what they feel. Now that everyone has warmed up to it, it has started to make a dent in this concern. This HR system is about how people feel, how they can be their best self at work, and asks the hard questions in a non-threatening way. It also integrates our objective tracking and brings it to front of mind every week. Whilst we love the Hi5 functionality, we use a seperate points based recognition system. It would be great to combine the two. Trial it. You have nothing to lose and everything to gain. The simplicity of this system is what makes it so powerful. Objective setting and keeping focus. Weekly check in's. Priority setting. Peer to peer recognition. 15Five has become an important part of our culture and something our team refers to when asked which systems or tools best support them in their job. We're actually surprised at how much the team embraces 15Five and how much value it's added. "Great way to "collaborate and listen"! " I appreciate being able to express my worries, concerns, and goals. This gives my manager a chance to see where I'm at physically and mentally. I also like being able to express appreciation for fellow co-workers. Working in IT, some people are remote so they don't get the recognition they deserve. But with the High Five tool, it makes it easy! This has been a great program and tool. This is a great tool to help you focus your career and goals. It can help you to find yours and others' strengths. Also a great way to commend other members of your team! Each week, there is typically one or more specific issues that you handle on an individual level. Those impact productivity and attitudes. With 15Five, you can state the problems, address them, and start getting in front of them. The benefits of just being able to vocalize the issue or stress is of great value on its' own. Not to mention the ability to have it shown to supervisors or others for solutions. "Refreshing take on Performance Management and OKRs"
15Five is a fresh take on the standard performance management annual review cycle. It implements continuous feedback well and non-intrusively, and adds a complete OKR system on top of that. Fans of John Doerr (Measure What Matters) will love the system. There's little I can think of that I dislike. Some things in the OKR system could be improved, like moving objectives from one parent to another, but that's easy enough to work around. We first implemented the system to help streamline one-on-one meetings and make them more effective. 15Five did that for us and soon people realized additional benefits of making reviews easier. Soon after our team implemented it the company adopted OKRs. Other departments were using spreadsheets to manage their objectives but when they saw 15Five they signed up for the system. We're started using it with our management tier and managers quickly clamored to have it for their reports as well. "Great for personal work goal tracking"
I like seeing the high fives the team gives to each other, and tracking my weekly goals, and checking in with how I'm feeling about life and the work load- Measuring change allows me to see what I've done to make me feel better or worse. What part of my week can I duplicate that continuously helps me meet goals I set. I like that I can check off the goals at any time in the week. I wish 15five was more integrated with Slack or other workflows- it is a bit of an afterthought and not well put into daily use. I also think there are some redundant parts of the platform, goals, objectives, 1:1's. The way 15five is set up is not very intuitive to a new employee. There could be a video to help new people get set up- and to revisit. During onboarding there is so much going on- that a specific training seems a little ridiculous. Making sure every week I'm making progress on personal data Driven Goals. For me- it is making sure I'm not just putting things on my "When I finally get caught up" list. I can see the things I've accomplished- things that have taken me longer to accomplish than expected. On Friday, when I fill out my 15five- if I can finish a task in less than an hour- I do it then and Don't push it to later. "15Five is the Best for Personal Growth"
15five has allowed me to focus on the goals that matter. When I first started using it, I created a ton of goals that eventually fell off the rails because I kept creating new ones along the way. With time I simplified my goals and stayed focused on a weekly basis in improving their metrics. So for the most part, it shows me my managing weaknesses with a number. It does not have a percentage calculator within the goals section, so I have to use external tools to calculate my goals. I use big numbers for this, so the calculator would be an awesome feature that could save me time. Effective for employee goal engagement and simple to use. My own performance for the most part. Since I work alone in my specific department, I do not tend to look at department goals. Optimizing and managing goals is what 15five has been crucial. "FINALLY A WAY TO HAVE HISTORICAL REVIEW DATA !!!!!!!!!!!!!!!!!!!!!!!!!!" Love Love Love the fact that its so easy for me to keep historical data of what my team has gone through and the experiences they are having during their team time at the company. The information gets passed from manager to manager so you can understand how they are developing. Being able to pull information from the 15five into 1x1s is great. Being able to just quickly add things to the 1x1 before hand AMAZING!!!!!!!! Peer Reviews are nice being able to control how is reviewing is a huge when. Ensure real feedback is giving and people are not just selecting their friends hoping for the best. Having 1x1 self close would be great. Sometimes I forget to close out a 1x1 and it would be nice to have a 24 close out from the time you start the 1x1. Give us real ways to see the growth of a team and individual. "15Five keeps me on track with goals and accountability." My favorite feature of 15Five is the fact that I know that I will receive supervisor feedback and help. It's not just another form to fill out. It's a tool to help me get better and have a voice to express victories, goals, and concerns too. At times I have gotten behind on a weekly 15Five if I am out of town or do not need to fill one out for a certain week. It would be nice to show and track that differently if I will not need to fill a review out on a certain week. At first, 15Five might seem like your supervisor is just checking up on you each week and this is just another thing you have to do. That is not the heart of 15Five. At least not with us. The heart is trust. If my supervisor trusts me and I trust him then my 15Five is a great tool to grow within this organization because we are both working towards the greatest benefit of each other and the organization itself. Never take trust for granted. When you have it life works so much better. When you don't you will labor at your work for sure. 15Five's implemented correctly can and will build great trust. It gives me and my supervisor talking points on both successes and areas to do better. No more guesswork when it comes to my goals and problems. "It's simple to fill out and you're reminded when it's due and over-due"
I like that there's no need for a big long review form every week. It's a few simple questions about your targets, some optional questions about anything that might be blocking you. There's no excuse not to do it every week. The user interface is ve is very intuitive,. Also, the ability to look at your previous 15Fives is a great way to remember what you were doing in a particular week. Finally, the High Fives are a very nice way to recognise the effort or help or work of someone else, on your team or elsewhere in an unobtrusive way. I dislike that the reminder email is sent to me at 1pm on Friday. I'd much rather it was closer to 4.30 so I can fill in my 15five accurately. Also my team's weekly standup is around that time of the week so it is helpful to know my next priorities. The best thing I like about 15five is that all my achievements in the week and goals for the coming week are all recorded. I don't need to recall everything that had happened in my work to give an account to my manager/ team leader. The reminder to fill it also helps a lot because sometimes I forget to fill it. The thing I dislike is that when I can't think of something to fill/ answer a specific question is that I need to fill the word "NONE" (because it is required) instead of leaving it blank. The business problem we have is that we have to recall everything that had happened over the past 6 months, and it's kinda hassling because we can hardly remember things that had happened over that specific span of time. The benefits that we have realized is that everything that has happened every week/ 5 days are all recorded and we don't have to recall everything. "15five is the best tool HR has ever rolled out in our company"
I love how quickly you can update your manager on the things you are working on in a given week and what you are struggling with. It really does take only 15 minutes to complete your review for the week and gives you a great idea of what you need to get done the following week. The mobile app is fantastic too. I can't really think of anything I dislike about the product. The only thing that has ever really annoyed me about the product is that I didn't' know there was a vacation setting. So now my % of on time completed 15fives is 98% percent. I would have had a perfect score if I have known there was a vacation setting. I now have a great idea of what my employee is working on in a given week. I can see where they evaluate their workload on a scale of 1-10 to make sure that I am keeping them busy, but also not overwhelming them with a ton of work. "Finger on the pulse of my team"
15Five has been essential to helping me meet my goals of being a better a manager. It is valuable to see the comments my direct reports and secondary associates give each week as well as their project updates. The information they provide helps me assign tasks with reasonable deadlines based on their bandwidth. I also like that we were able to give our manager and peer reviews through the tool, replacing an outdated system that took too much time, and was not user friendly, with no technical support other than our HR staff. I think the manager review portion is a bit confusing as well as the objectives input. We found a way to make it work, but better training on these features would be very helpful. Do it! It is valuable and worth every penny! I am able to give informal, but frequent feedback to my associates without having to set up meetings. They know that I am seeing their comments and can address any issues that arise almost instantaneously. Also, the ability to give high fives has helped boost morale in the department and a favorite to see! "Engaging our team in reflection and renewal"
15Five helps us share our weekly highlights, identify issues that we need support with from others, and High Five each other for ways that we supported one another in an easy-to-use interface that drives participation. We used to use an internal tool do to this but 15Five's interface is engaging with a great mobile app and far better than we could keep up with in an internally developed tool. The only gap I see in 15Five right now is that you can't have a circular reviewer relationship - for example, in an organization with two co-founders that manage each other, they can't both review each other. One person has to be at the "top". 15Five helps us stay in touch with one another, and streamlines communication when a staff member needs support or advice from others. "Quick and to the point review"
you dont spend too much time doing reviews, process is easy and allows for quick constant feedback. Goal setting also a breeze. keeping track of achieved goals also very efficient. Tool is simple to use and will allow collaborators to speed the process of goal setting, allows users to provide feedback on other users outside the department allowing for overall evaluation. We were finding last review without followups, with 15 five is easy to followup and keep track. "An amazing communication tool for greater employee-manager relationship"
- Effective: This tool works. Takes out a lot of the stress that come from traditional 1-on-1 meetings, it gives employees freedom to express concerns in written format that otherwise might not be easily communicable in short face-to-face meetings, for people who dislike confrontational conversations this helps them organize their thoughts in written format and send them to their boss. - Even for positive feedback: Employees can now be encouraged to put on record their achievements, a lot of introvert employees do not like to brag about their accomplishments, the Q&A style of this tool encourages all employees of all personalities to communicate with management, thus giving much greater insight into their employees mindsets and thought process and enabling the organization to significantly increase its employee retention rate. 1- Employee-manager commutation: this is an essential and brilliant tool to assist with employee-manager communication. Learning about 15Five Continuous Performance Management? * We monitor all 15Five Continuous Performance Management reviews to prevent fraudulent reviews and keep review quality high. We do not post reviews by company employees or direct competitors. Validated reviews require the user to submit a screenshot of the product containing their user ID, in order to verify a user is an actual user of the product. Hi there! Are you looking to implement a solution like 15Five?